This type of Cover presents the LED Lamp beads clearly and really. 1. This U-shape aluminum channel with milky white cover, softens the "spottiness" of LED strip lights, producing a more consistent and pleasing light. 2. It's designed for different applications, perfect for indoor/outdoor use, such as furniture compartments,stair railways, under cabinet, window, door frames, bar and so on. 3. Customization available, this aluminum channel is extendable and sold by meter. You can add as many meters as you need and connect them together. Note: Fit for LED strips that less than 20mm. LED strip light is NOT included in the channel. V shape channels (for corner mounting) : B01DM7G35S (vertical plane cover); B01DM7G91G (curved surface cover); B01F6WDQHU. U-shape anodized aluminum channel, better heat dissipation, for both recessed (flush) and surface mount LED lighting projects. Fit for PCB width <20mm (0.78inch) LED Strips, such as SMD3528, SMD5050 & SMD5630 single or double row LED strips. It's designed for housing decorative, such as furniture compartments, showcase, under cabinet, window, door frames, bar and so on. 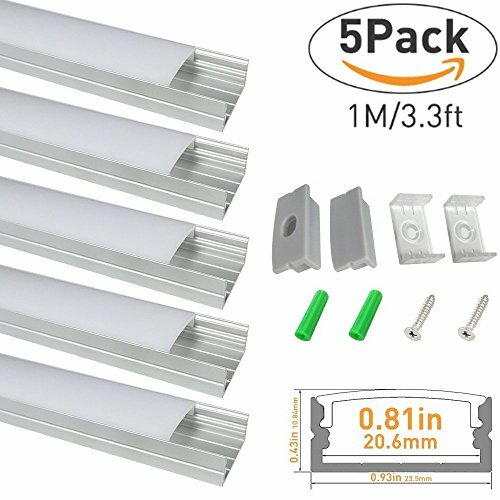 Package includes: 5x 1m/3.3ft per segment with cover, end caps (x10) and mounting clips (x10) ; For additional end caps please search B01GP876BG; Extra mounting clips please search B01GP871RK on Amazon.For Ultra thin Crystal LED Channel light with Acrylic covers,pls search B07GDKJ2GF.